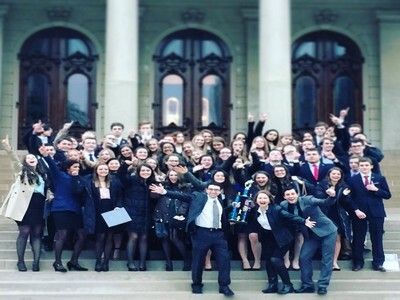 East Grand Rapids High School, led by teacher Janice Yates, took first place at the 2016 Michigan We the People State Finals held January 8 at the Michigan Capitol Complex in Lansing. East Kentwood High School (teacher Hillary Baker) finished second and Marquette High School (teacher Fred Cole) finished third. Every year, volunteers dedicate their time to evaluate the students’ performance during the simulated congressional hearings. One judge said, “To see and interact with all those eager, well-prepared students and their teachers and parents and friends give me faith in the future”. The event would not have been possible without the over fifty volunteers who spent the day with the students. With their first-place finish, East Grand Rapids qualifies to compete against other states in the 29th We the People National finals, held in Washington, D.C., and at the University of Maryland, April 22-25. In addition, Michigan has been awarded a wildcard spot this year making second place East Kentwood high school eligible to advance as well. Each team won three Unit Awards at the State Finals. Other participating schools included Cesar Chavez Academy High School, Detroit; Coldwater High School; Howell High School; Hudsonville High School; Marian High School, Bloomfield Hills; The Potter’s House, Wyoming; and Richmond High School.